It was sweeter the second time around for Joshua “The Passion” Pacio, 22, of Baguio City, Philippines. Representing Team Lakay, the Filipino mixed martial artist failed to capture the ONE Strawweight World Champion title the first time he fought for it but he finally earned the title in his second attempt. Pacio became the new ONE Strawweight World Champion on September 22, 2018 at “ONE: Conquest of Heroes.” He dethroned then reigning champion, Yoshitaka “Nobita” Naito, 34, of Matsudo, Chiba, Japan. It was a rematch between the two strawweight standouts almost two years after their first encounter. It was on October 7, 2016 at “ONE: State of Warriors” when Pacio first tried to capture the ONE Strawweight World Champion title from Naito. At 1:33 of Round 3, the Japanese champion submitted his Filipino challenger via rear-naked choke. But at “ONE: Conquest of Heroes,” Pacio finally got his long-awaited redemptive win. Neither he nor Naito was able to finish the main event of the evening via submission or knockout. After three five five-minute rounds, the bout between Pacio and Naito was left in the hands of the judges. Referee Olivier Coste raised the hand of the Team Lakay fighter as the winner via unanimous decision. Losing to Pacio at “ONE: Conquest of Heroes” downgraded Naito’s professional MMA record to 13 wins and 2 losses. The Japanese MMA veteran now has 3 wins and 1 loss in ONE Championship. On the other hand, Pacio’s professional MMA record improved to 13 wins and 2 losses. In ONE Championship, he has 6 wins and 2 losses. After the loss to Suzuki, Pacio defeated Roy Doliguez, Ming Qiang Lan and Pongsiri Mitsatit. 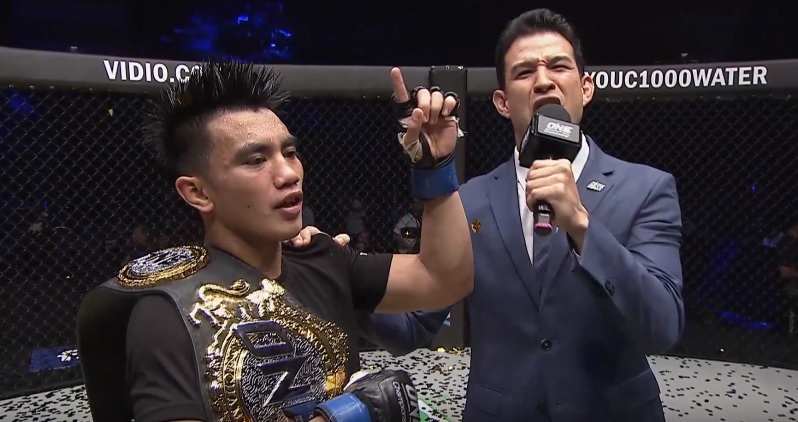 The other ONE Championship opponents the Team Lakay fighter defeated were Rabin Catalan, Kritsada Kongsrichai and Dejdamrong Sor Amnuaysirichoke. With Pacio as the newly crowned ONE Strawweight World Champion, Team Lakay now has three reigning world champions in Team Lakay. The other two are reigning ONE Flyweight World Champion Geje “Gravity” Eustaquio and reigning ONE Interim Bantamweight World Champion Kevin “The Silencer” Belingon.